Do you have bats in your attic, crawl space, bats in the chimney, or walls? Need to get rid of them and you don’t know who to call? Wildlife Removal Pros is your licensed and trained bat control experts for all types of wildlife issues. We are a wildlife management company, meaning we do not handle dog or cat calls. We are NWCOA certified, and also Bat Standards Compliant. We have completed various wildlife control training and workshops about bat management, and have helped many customers with their bat problems. If you have bats, give us a call today! We can help. KY Wildlife Pros in Central KY is your source for bat control in Versailles Kentucky. Scientists estimate that over 900 to 1,200 bat species exist worldwide. In fact, bat removal in Versailles is common because bats constitute 20% of the entire mammal population on the planet. North America has its share of bats and the wildlife issues that they cause. More specifically, 45 bat colony species exist across the continent, and many of them are present in Kentucky. In fact, some Kentucky bats include Eptesicus fuscus, Myotis leibii, and Lasiurus cinereus. Ordinarily, if you contact an animal removal company they refer to them as the Big Brown Bat, Eastern Small-footed Myotis, and the Hoary Bat respectively. The oldest bat fossils discovered by researchers is 32 million years old. 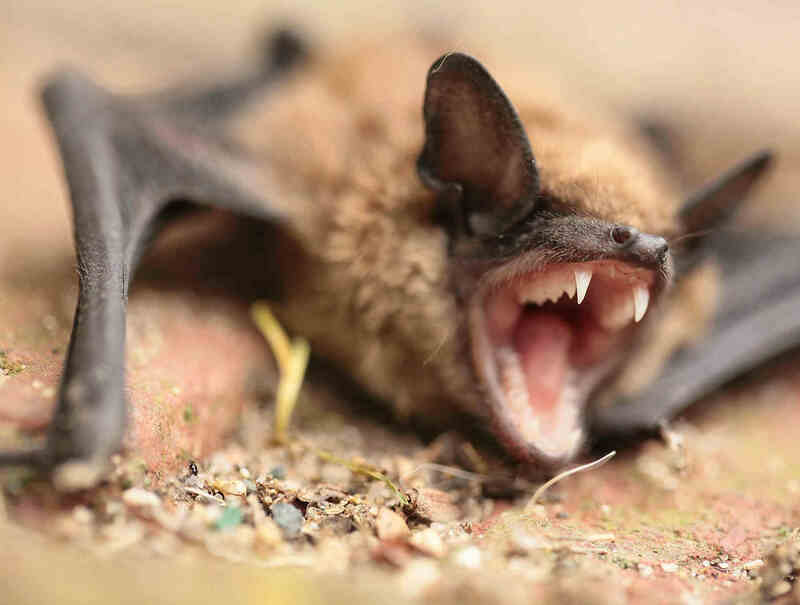 No matter the species, animal removal specialist for bats in Versailles Kentucky can help you. It is to be noted, Fayette County does not handle nuisance wildlife. Many people falsely believe that bats are rodents and look for Versailles bat control when they realize that they have bats in the attic however, bat removal the scientific evidence for their present classification is overwhelming. For example, these creatures have mammary glands, three bones in their inner ear, and hair. They give birth to live young as well, as all mammals do except the duck-billed platypus and the spiny anteater. During the bat maternity season they can not be removed nor can damage repair be started for bats in the attic. The wings of the bats are mainly made of cartilage but don’t contain calcium in it. The tips of the wings bend without tearing the wings or getting it damaged. It contains a flat section in the middle to allow for plenty of support in the wings. The wings are also flexible and it allows to bend in all directions. The bat’s skin is elastic and can stretch. Bats have tiny teeth but are razor sharp. This allows for these bats to cut through their prey or the skin of the fruits. They also have a very long tongue that they use for pollination, drinking, and eating. They roll the tongue around their ribcage when they are not using it. Their eyes vary depending on the bat species. The category of microbats, for example, have very small eyes and aren’t well developed. Most bats have vision contrary to the myth. In fact, some species of bats can see through ultraviolet lights. Bats hear and communicate through the mechanism of their inner ear. Bats communicate through echolocation and allow them to hear through vibrations. Many people looking for help fear them unnecessarily. If you ask any bat removal professional, they will correctly inform you that they are instrumental when it comes to helping human lives. More specifically, scientists have used them to research on low-temperature surgery and blood clot medication. Additionally, Versailles bat exclusion they have even helped humans advance their military capabilities. For example, weapon experts have studied the way they avoid obstacles and find food using sonar. They have used this knowledge to develop sonar systems that detect mines and submarines. Bats play an important role in the environment. Plants rely on bats to pollinate and spread their seeds. Nectar-eating bats pollinate flowers just like bees. They travel from flower to flower and they transfer one pollen to another. In fact, many of our plants rely on bats rely on survival. These plants include avocado, bananas, breaadfruit, peaches, and many others. Bats also control pests as they eat a lot of bugs. This helps reduce the amount of damage done by the insect pests. Bats can carry mites, fleas and other parasites that are likely to find a way to your home. If you have a bat infestation there will have a lot of bat droppings all around the entry point, the walls, attic and close to where they are roosting. These droppings will contaminate your home’s insulation and can cause diseases and infectious spores that can be a danger to you and your family. Determines the types of animals removed. In Versailles KY, typically refers to someone who deals with dog and cat needs. KY Wildlife Pros handles all of your Central KY wildlife control needs. This ranges from Versailles bat removal, Versailles squirrel removal, trapping to get rid of skunks, Versailles raccoon removal, wildlife exclusion, damage repairs, pest removal and more. Once skunks removed from the property are taken away, skunk proofing is done to keep out future animals. The same process goes for raccoon removal from under decks, stoops and sheds. Many people in Fayette County associate with death, witchcraft, darkness, and malice. That is because of their character. Bats are an important part of Kentucky’s wildlife and are highly secretive creatures that roam and hunt in the dark. Usually, they hide themselves during the day as a Versailles animal that is nocturnal. Another behavior that people find strange among them is that they hang upside down, as they rest and sleep. Hanging upside down is also a means of preparing them for flying since their wings produce an insufficient amount of lift when compared to birds. Bats love roosting in attics, barns, caves, and trees. They can fly as far as 31 miles away for food before coming back to your home. They can be a pest animal when they have moved into a home. Bats are the slowest reproducing animals. The gestation period of bats stars in 40 days up to 6 months, but bigger bats have longer gestation periods. Bats mostly produce only one pup. Mother bats often have maternity colonies in which females form colonies to raise their young. Male bats do not help raise their pups. Bats mate in the fall and give birth in the spring. Female bats store the male’s sperm until the spring arrives. Other bats keep the fertilized eggs from growing until the spring. The females give birth in the spring when there is enough food in the environment. Female bats need a lot of food to feed for themselves and their babies that is why Spring is the best season to give birth. The babies grow in flying size within just a couple of months. During that time, they start to leave the roost. Bats can be nuisance wildlife but according to they are useful to humans in their natural environment. Hence why wildlife trapping should never be done for any wildlife animal. Preventing them with the help of wildlife removal companies is an excellent idea. You can do that by getting rid of bats in your attic or home as soon as you notice that they are there. Remember, it involves handling bat droppings (guano). Only professionals can do that so call on them today to remove Versailles Kentucky bats from your home. Bats in the chimney can create a real health hazard. The exclusion method for chimneys is much different than bat inside attics. Usually, when a colony is in an attic, bat valves are places to get bats out. We are just one call away. We are a team of experts who dedicated to work and help you. We are trained and experienced. Call us immediately to avoid coming into contact with people. We can come to your home or business and do a thorough inspection of the entire structure and determine if there are living there. We will take the necessary steps and make sure you do not have the problem again. We also provide bat guano cleanup.